In Australia there are about 70 groups of people from Bronte. The great part of these live in Victoria, specially in its capital Melbourne, and in New South Wales, particularly in Sydney. I am not able to give a complete view over the immigrants from Bronte in Australia. It is truly difficult to acquire precise information on this matter, as I can only get information mostly by word of mouth and often only through the phone. So any gap or eventual mistakes should not be blamed to negligence or will to deceive. The first folks from Bronte who landed in Australia were Luigi Destro, uncle of Nicola Destro (now President of Sydney Sicilian associations federations), and Salvatore Messina. They arrived during the first six-month period of the year 1926. The 22nd of September 1926 arrived, with the ship “Caprera” the 24 years old Carmelo D’Aquino. In 1952 Carmelo started a wine-making industry, still in existence, in the city of Orange. Married with Antonina Liuzzo from Bronte, had a son, Illuminato, now a lawyer in Griffith, and a daughter called Vincenzina. Carmelo died at Griffith at a hundred years of age the 11th of November 2002. A little later came Giuseppe Prestianni. In 1930 arrived Antonino Meli-Pecorino (the surname should have been Pecorino, but because of a mistake during the transcription at the Bronte’s Council, this family now has the wrong name of Meli), and Mario D’Aquino, a brother of the above mentioned Carmelo. Subsequently came Angelo Buttiglieri, whose daughter Nunzina shall marry Mario D’Aquino. 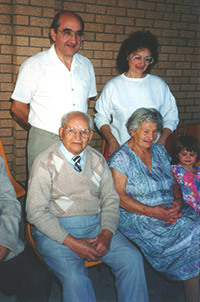 After the second world war came to Australia Ignazio Liuzzo, brother in law to Carmelo D’Aquino, Giuseppe Cariola, carpenter and Salvatore (Sam) Di Bella, who, after 40 years in Australia has gone back to Bronte and is now one of the creators and collaborator of the Web-site “Bronte Insieme”. And then arrived Francesco Saitta (Vannazza) and family. 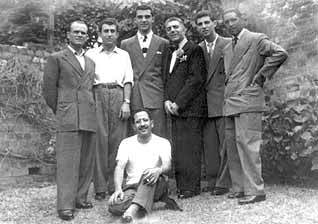 The professor Nunzio Ponzo, Di Sano Salvatore, the brothers Giuseppe, Biagio and Nino Capizzi, Alfio and Nunzio Bellia, all of them called over by Giuseppe Prestianni. Followed the sister of the Capizzi brothers, Giuseppina Maugeri and then Rosetta Bombaci and Alfio Bonaccorsi. 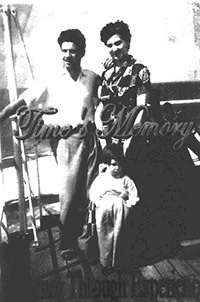 The 19th of December 1953, from the ship “Sorrento”, landed in Sydney Francesco Liuzzo, brother of Ignazio and Antonina, with his wife Maria Imbrosciano and his three years old daughter Ignazina. They had left Bronte 31 days before. Afterwards came Ignazio Bonaccorsi with his wife Agatina and his sister Nunzia Bonaccorsi married to Biagio Ponzio. Followed Elena Bonaccorsi, Alfio Rubino with 2 brothers and 2 sisters and the Gatto family. At the end of years ’50 arrive the Greco families: Alfina Greco, married to Vincenzino Pace, called over also his brother Giuseppe Greco. Subsequently arrived Maria Proto, wife of Giuseppe Greco and their daughter Anna, Giuseppe Greco’s sisters: Gina, wife of Giuseppe Azzarello, Nunziatina, wife of Nino Caudullo, and Maria married to Ciraldo. And arrived also the Gangi family and Mrs. Longhitano, Francesco Saitta’s sister in law. 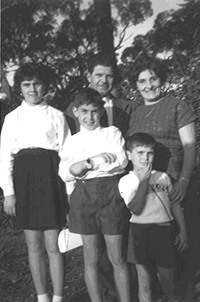 In October 1962 arrived Nunzio Imbrosciano with his wife Nunziatina Liuzzo and their son Antonino (now professor of scholastic philosophy at Sydney). Followed the Parrinelli, the Ciaramiddaro and the Calcagno. Next arrived Antonino and Giuseppe Sciacca. In 1972 arrived Biagio Meli with his wife Nunziatina Sanfilippo, their daughter Alfina and the brother in law Illuminato Sanfilippo. 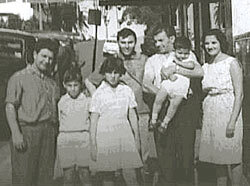 Nunziato Sciacca with his wife Nunziata and their sons Francesco and Alfredo arrived at the end of 1972 and were the last persons to get beneficiary travel help. The 15th January 1973 landed in Sydney Bruno Spedalieri who seemed to have closed the brontese migratory flow towards Australia. 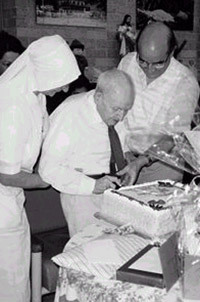 Carmelo D’Aquino’s family and, to the right, the same Carmelo cutting the cake of the 100 years, assisted by his son Illuminato. November 1953, on the ship “Sorrento” bound for Australia: Francesco Liuzzo, his wife Ma­ria Imbrosciano and his small daughter Igna­zina. To the right, ten years after in 1964: Fran­ce­sco Liuzzo, the wife Maria and the sons. 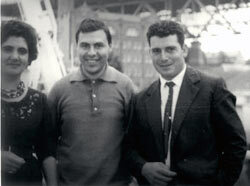 Igna­zina, Antonio and Salvatore at Cre­morne of Sydney. 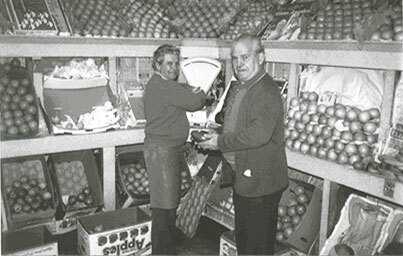 The two fruiterers (the brothers Francesco and Ignazio Liuzzo in their fruit and vegetable shop at Kirribilly in 1985). This photo of Bronte’s emigrants was taken more than half a century ago, exactly during the month of August, 1950, in the backyard of mr Nunzio Destro’s house. In the middle, sitting on the ground, dott. 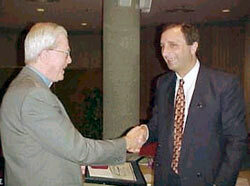 Nunzio Ponzo. 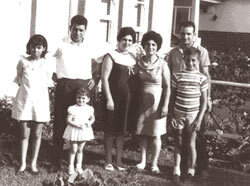 3) In Sydney-Ashfield 1968: at left Giuseppe Greco with his wife Maria Proto and the daughters Anna and Teresa with them there is Nunzio Imbrosciano with the wife Nunziatina Liuzzo and their son Antonino , future professor. 4) Antonino Imbrosciano, portrayed while getting a recognition praise. The 7th August 1988 a group of Bronte’s people living in Sydney, gathered in the parochial hall of the Leichhardt ‘s Capuchin fathers, constituted The Associazione Maria Vergine Annunziata. Biagio Spata, Ignazio Bonaccorso, Nick Spata, Nunzio Pappalardo, Nunzio Ponzio, Robert Bonaccorso, Pina Mauceri, Rosetta Bombaci, Alfio Bellia, e Ignazio Liuzzo. They elected a managerial committee to which was added also the doctor Nicola Destro. The committee has straight away ordered the Palermo’s firm Micciche’ to make and send to Sydney a fibreglass copy of the Annunziata di Bronte ‘s statues at the cost of about 15.000 dollars. As the statues arrived in Sydney, were placed in the in the parochial church of Holy Mary of Concord the 19th of May 1991. On the 29th of March 1992 a gilded mantle, bought in Italy for about 8.000 dollars and donated by all association’s members, was blessed and laid over the statue of the Annunciate Virgin. At 150 kilometre from Sydney there is Berrima, an historic and tourist country town which contains a pilgrimage area called Penrose Park. This area is enriched by tens of sacred icons and chapels built by the various ethnic Catholic groups. The faithful folks of Bronte living in Sydney decided to build in that sacred place the most beautiful chapel compared to the others, a chapel that, even if not precisely, tries to reproduce the Annunciate’ church of Bronte. 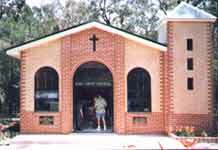 The erection of the chapel started in February 1998 and the 9th of August of the same year the Catania’s archbishop Mons Luigi Bonmarito, in visit to Sydney, has blessed and inaugurated the said chapel. The Committee members of the SS Vergine Annunziata Association at the moment are: Pamela Ciaglia, president, Pina Maugeri, vice-president, Biagio Meli, treasurer, Tino Sanfilippo, vice-treasurer, Francesco Calcagno, secretary and Gino Cavallaro, Antonino Sciacca Giuseppe Sciacca, councillors. The fiberglass copy of the Angel and the Madonna Annunziata’s statues and the chapel of Penrose Park, was commissioned by the Virgin Mary Annunziata Association founded in Sydney by a group of Bronte’s people in 1988. Sulfaro from Lipari, Mons. Bommarito. And, from Bronte, Destro Nicholas, president of the Committee, Gino Caval­laro, Biagio Meli, Pamela Ciaglia, Giuseppe Sciacca and Pina Mauceri.